Thinking about remodeling your bathroom? I’m working with a client now who is dreaming of a "spa-like" master bath. HomeAdvisor says the national average is around $9,800 with a range of $5,900–$14,000. Here in New Jersey, the reported cost for a "mid-range bath remodel" is more than $18,000, with upscale baths costing upwards of $57,000. Why this huge fluctuation? Labor, of course, is more expensive in the northeast, but materials can vary wildly in price. Tile is one of the biggest expenses in a bathroom remodel and a quick shopping trip to a tile store will give you a great education. Sure, you can get a nice white subway tile for about $2 per square foot, but that gorgeous crackled finish tile is only $7. And that marble is only $12! In an average 5x8 foot bath, you can easily spend $1,700 on tile alone. Massive built-in tubs with tiled platforms are a thing of the past. People are replacing them with graceful free-standing tubs. You can easily spend $1,000 or more for a free-standing tub and that doesn’t include the tub filler. These standalone beauties are considerably more expensive than a standard wall mounted tub faucet (usually $1,000 or more). Tub size is also a consideration; those extra-large soaking tubs might warrant a second water heater. Tub materials include acrylic and cast iron. I like the feel of a cast iron tub and I think it retains heat better than acrylic tubs. I have one in my bathroom, but needed 4 men to put it in place (another expense). Showers are also taking center stage in master bathrooms. Many homeowners are opting to remove their tubs entirely, so they can have a spacious walk in. Rain showers are all the rage right now. I love the way they look, but after using one in a hotel a few months back, I recommend a combination of a wall mounted slide bar/hand held shower and a rain style shower head with a diverter. Rain showers are wonderfully relaxing, but the flow is not adjustable, and have wider body coverage, so you can’t keep your hair dry. Full body jets and steam are fabulous upgrades to your shower experience. Costs for these new styles and features run anywhere from $600–$10,000 depending on construction and finish. Materials for showers include solid surface, stone and a myriad of tile selections. Frameless shower enclosures are beautiful, but the cost is double or triple a standard shower door. And don’t forget about shower seating; it’s nice to have a spot for shaving your legs or just relaxing. Technological advances in the shower allow you to have preset conditions for each user, chroma therapy—and even aromatherapy—for a true spa experience. Even toilets have gone tech! They come with lights, anti-bacterial coatings, heated seats, even self-cleaning! I was walking through a design center the other day and the toilet seat opened while I walked by, almost like an invitation! Cabinets can be built-in or free-standing to look like furniture. Sinks can be undermount or a stylish vessel sink that sits on top of a base. You can pick up cabinets on Wayfair or at big box stores, but try to avoid medium-density fiberboard (MDF) and particle board construction. Neither are good choices for high-moisture environments, so although they tend to be less expensive, they may cost you more in the long-run. Some high-end manufacturers are building tech into their cabinetry, like USB charging stations, LED lighting and Bluetooth capability. All very cool, but personally I feel as though too much tech takes away from the relaxing atmosphere. Brass, antique brass and rose gold finishes are gaining in popularity again, but polished chrome never goes out of style. Look for physical vapor deposition (PVD) finishes because they typically have lifetime warranties. 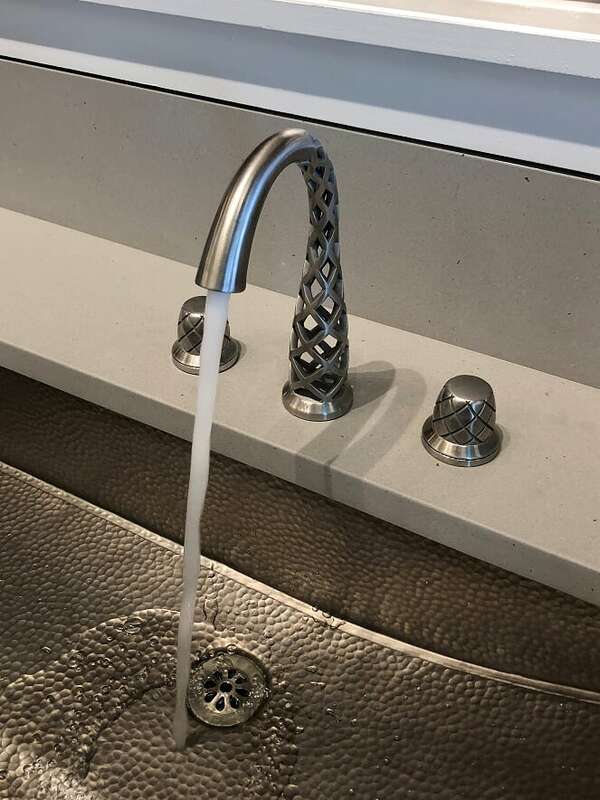 Pricing for faucets can run as low as $75 for a simple faucet to $20,000 for this digital showstopper I saw on a recent shopping trip. When purchasing a tub remember to try before you buy. Tub pitch is important if you don’t want to be sitting straight up as you relax in your bath. Look for ceramic disc cartridges and brass construction in faucets to ensure longevity. Plastic interiors are cheaper, but won’t last. Make sure the drain is also metal as plastic construction with a metal finish can peel over time. And make sure you look for leak-proof housing when shopping for shower faucets. Comfort height toilets are a few inches taller than standard toilets and are great if you’re tall. But it's another thing you might want to test drive if you’re "height challenged." Don’t mount light fixtures too high or overhead as they cast horrifying shadows that age you. Opt for sconces on either side of the mirror mounted at your head height. You need a lot of light when getting ready in the morning, but install dimmers for when you’re soaking. Investing in a designer can save you money – you don’t know what you don’t know and they can help guide you thru the myriad of choices out there. For help with your next bathroom remodel, reach out to me and I'll be happy to help ensure you get the cozy bathroom you deserve!